Blue Pacific remote solar power supply (RSPS) systems are stand-alone solar power systems designed to supply a wide variety of remote power requirements. 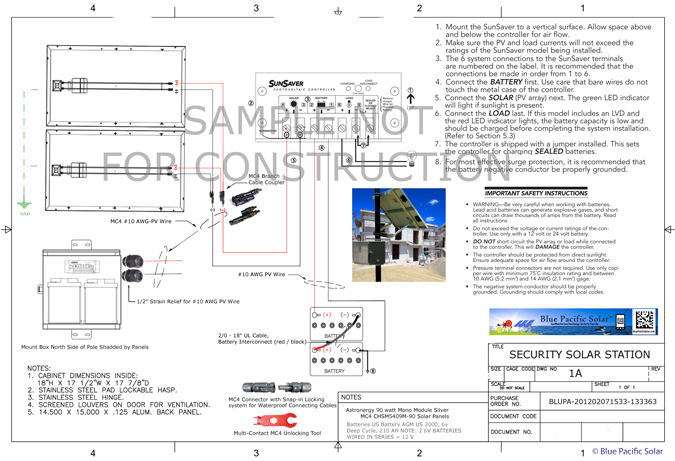 All RSPS systems are complete packaged systems consisting of solar modules, mounting structures, batteries (if noted otherwise optional), battery enclosure, PV wiring and necessary charge regulation circuitry. RSPS systems represent the highest standards of reliability. All components have passed rigorous testing and are suitable for use in the harshest of environments. Suitable for powering lights, sensors, monitors, security cameras, illuminated signage, traffic signals, communications equipment and more. Designed to perform in remote and industrial settings where durable construction and reliable operation are critical. Our RSPS systems are built on years of experience designing reliable solar-powered equipment for telecommunications, signal, traffic, railroad and oil industry projects. They come with a single line wire diagram which shows you how to connect the equipment. Blue Pacific Solar RSPS systems are designed to operate flawlessly in the most harsh environments. The lightweight non-insulated NEMA 3 aluminum battery enclosure offers corrosion protection in most environments. Majority of system ships in 5 - 7 business days after funds clear. Ironridge rack drop ship direct from manufacture in 10 - 15 business days. MorningStar has been a leader in the solar industry for over 16 years supplying quality solar controllers and inverters. Morningstar is a privately owned US corporation with a commercial office located near Philadelphia, and engineering lab in Columbia, Maryland. MorningStar products are manufactured in an ISO 9001 certified facility. 270W Remote Solar kits are integrated solutions for a wide range of industrial applications. Remote power systems our Solar Energy Consultants have provided here are the ideal solution for telecom, security, telecommunications, scientific equipment, and data reporting. Each pole mount kit incorporates solar panels, a charge controller for the battery bank, DC distribution capabilities, and an optional telecommunications-grade DC/AC Inverter into a robust passively cooled outdoor enclosure and solar panel rack. The system can be located in the telecommunications compound along with the telecommunications ground-mounted equipment to provide a reliable source of power. Telecommunications, microwave repeaters, wireless security systems, mobile telecom are examples of effective uses for remote power systems. Solar powered traffic signals can be located anywhere it is not practical or cost-effective to install a utility connection. It can be equally useful in an urban setting or on remote stretches of highway. It is the best solution for mobile warning signals and speed monitoring. 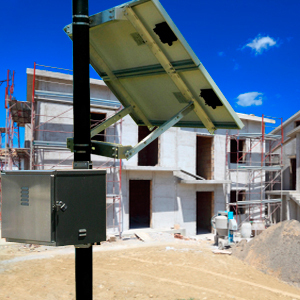 Outdoor lighting solar systems are often used in parking lots and bus shelters, and to illuminate highway signs. Vaccine refrigeration systems play a key role in the storage and distribution of vital vaccines and blood in remote areas of developing countries throughout the world.